This captivating fragrance is just like a ‘walk through the Irish countrywide’. The tone of scent is rich, fresh, sporty and unforgettable. ‘Voyage’ opens with top notes of iris and lemon verbena. The middle notes include violet leaves. The base notes are ambergris and Mysore sandalwood. Our beard oils are handmade in small batches to ensure a high quality product made just for you. Each beard oil possesses a masculine fragrance and a light character as they gently moisturise both your beard and face – leaving you ready to take on the day and whatever it throws at you. Our Beard oils are hydrating to the skin and helps soften and tame beard hair, which means it also does double-duty as a styling agent – the ideal beard should look shiny and groomed — not dusty, flaky and shaggy. Best applied to a damp beard. Use daily for full benefit. Thanks to moisturising oils, a little beard oil is just enough to tame those flyaway hairs and eliminate flakes (a.k.a. beard-druff). For best results apply the beard oil first thing in the morning after showering or cleansing. Here, your hair follicles and pores are open and easily absorb the oil. Rub the beard oil into your hand, then massage it throughout your beard. If your beard is longer, use a comb to make sure the product coats every hair and moisturises your skin. Our Length Guide is below. 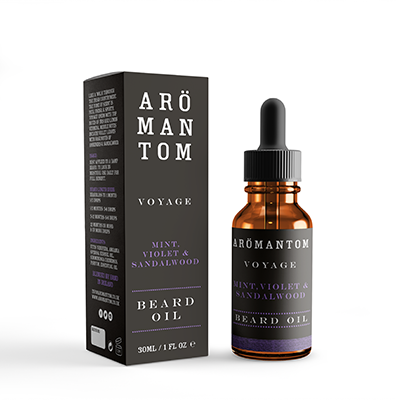 Aromantom are a male grooming range made in Ireland. Each of our products are made in small batches to ensure consistent quality throughout, using natural products where possible. Subscribe to our mailing list for all the latest offers, competitions and new products.